One of the many benefits of OnCue using single pages for is the ability to add and replace pages of documents after they're in OnCue. Adding pages to a document is easy. 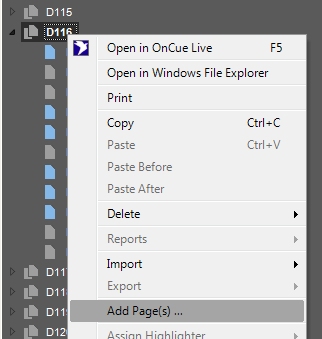 Put the new pages into the underlying document folder using Windows Explorer, then right click in OnCue on the document you'd like to add the pages to and select "Add Page(s)"
OnCue will add the pages to the end of the document, but if you need them anywhere else, simply drag them into their proper place.